Important: Cate only gets her pacifiers during naps or nighttime. 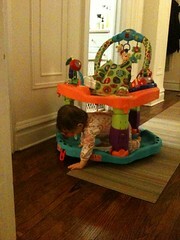 At least once a day I plop Cate into her crib for a minute while I do something, usually to tidy up her room quickly. Lately, the second she gets in her crib she locates and then drops all of her pacifiers out onto the floor. I usually forget to pick them up. We'll be out in the living room playing and all of the sudden she's been to her room and now she's coming back out with a pacifier in each hand and one in her mouth. If you look, she's got a pacifier in her mouth in this picture.